- Each rose is delicately packed to ensure fragile item to be unharmed, in a presentable lovely gift box to enhance quality and gift giving. 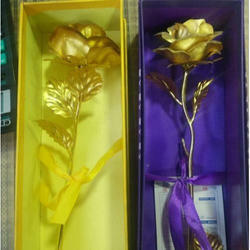 - Gold Roses are real roses dipped in 24 K gold to preserve the roses for a lifetime. Sakshi Jewellers from the family of diamonds is introducing 24K gold gift line. The products are designed mainly for corporate and bulk orders. There can't be a better gift then gold. 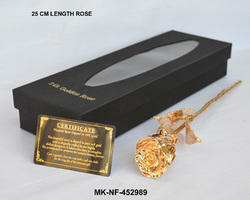 - This Unique handcrafted non-tarnishing 24K Gold foil Rose flower comes with certificate of authenticity. - Roses have always been a symbol of eternal love, beauty, and appreciation. This is a great gift for guys to buy, that any girlfriend would love to receive. 24K Gold Plated Rose with its authenticated Test Report. Our clients can aail from us a wide range of Gold Plated Flower that are widely used to enhance the beauty of the premises either indoor or outdoor. Known for durability, elegant designs, patterns & sophisticated look, our flower are available in various colors, styles and designs. Beautiful golden rose . It looks very beautiful. It is best option for gfting to your loveonce on velentines day.